The Festival of Fire is a remnant of the ancient religion of Zoroastrianism, where fire represents God‘s light or wisdom. Zoroastrianism was the official religion of Persia (now Iran) from 600 BCE to 650 CE. Around 2000 years ago followers of this doctrine built firehouses and temples where a fire was kept ever burning. The ruins of these sacred sanctuaries are now considered important archaeological sites in Iran, Iraq, and India. The festival of Chaharshanbeh Suri has its roots in the Zoroastrian celebrations of the battles of fire against evil. Granted, this time-honored religion does not put a lot of emphasis on rituals, but rather the ethical practices of ‘Good Words, Good Thoughts, and Good Deeds’. Fire, not only in historic Persia, has long been held as sacred among Indians, Europeans, and many other cultures. According to ancient Iranian beliefs, Azar (Fire) was the son of Ahura Mazda. Ancient Persians believed in the purity and purifying power of fire. The belief was so strong that, to prove one’s innocence, people had to cross through the fire, as Siavash did in Ferdowsi’s epic poem, the Shahnameh. Chaharshanbe Suri (Chaharshanbe Soori) is the festival of fire. Chaharshanbeh means Wednesday and Suri has the meanings of red, party or festival. People would also put food, sweets, flowers, and wine on the roof of their houses and pray for their dead to appease them. This is the origin of the fire festival in Persia before the arrival of Islam and was held in the last five days of the year. 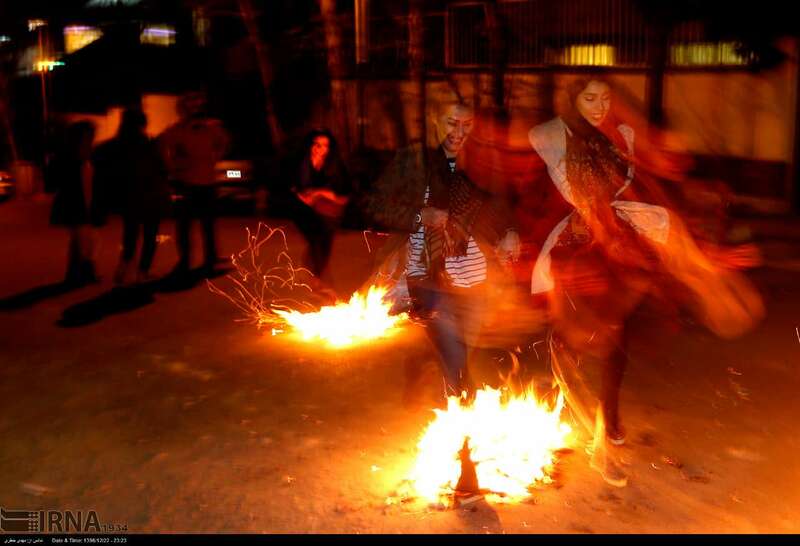 But where does Chaharshanbe Suri originate from? meaning “give me your red color and take back my sickly pallor”. This tune is sung to dispose of sickness and difficulties and to replace that with health, wealth, and happiness for the year to come. Other rituals of the Chaharshanbeh Suri celebrations include traditions of qashoq zani (banging spoons) and kuze shekani (smashing the pot). In the course of qashoq zani قاشق زنی youth cover themselves with textiles and chador, bang on pots and pans with spoons, and go door to door in their neighborhoods. They keep on hitting on their vessels tirelessly until somebody comes to the door. Girls and boys alike use this as an opportunity to visit their favorite neighbor in disguise and potentially establish a connection with a beloved in the hopes that he or she opens the door. Upon hearing the pots and pans, the homeowners greet the young visitors and place candy, nuts, and other treats in their bowls. This is a similar tradition to trick-or-treating at Halloween. To round up the festivities, smashing the pot کوزه شکنی takes place after jumping over the bonfire. This custom symbolizes transferring one’s misfortunes to the pot itself and breaking the pot so that bad luck is dissipated. This tradition is celebrated with small variations in different regions of Iran. In some provinces, some choose an unusable, old pot instead of a new one. Tehranis would place some coins into a jug and drop it from the roof onto the street. In Arak, the pot is stuffed with grains of barley. Throughout Khorasan, a piece of charcoal signifying bad fortune, salt to ward off the evil eye, and some coins for charitable donation are placed into the pot prior to smashing it.